Retail $129.95 SAVE 5% ! Patriotic pride fills this small American community. This delightful town features a variety of resin structures that are fully assembled and painted. To complete your display, special base sections and N Scale car and loco sets are available separately, or choose a starter set to get you going quickly or a premium pack with everything included. PLEASE NOTE: Buildings are not actual N Scale and sizes vary. 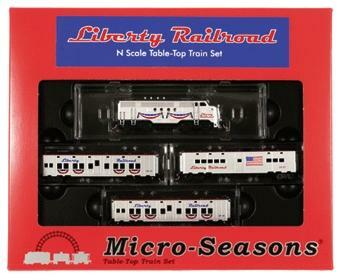 Decorated in red, white and blue, this patriotic passenger train features two Liberty Railroad sleepers and a Liberty Railroad kitchen car (all former troop cars) pulled by a Micro-Trains FT diesel locomotive. It's a perfect addition to your Liberty Town USA community.